We've started seeing pheasants in our neck of the woods as well, Candace. I love the noises they make...kinda like the "Aflack" duck. We usually have a pair nesting under one of the low-branched evergreen trees in the "back forty" of our property. I hope they return this spring. Such a beautiful visitor! I'm sure he will love your pancakes! Such a beautiful bird. We have roadrunner that visits our backyard. Always such a thrill. Freddie is a handsome fellow. Love the peacock/pancake story. Glad this new Freddie has a place to hide from folks with guns!!! We used to see lots of pheasant growing up, but they are a rarity around here now. Enjoy him! I loved hearing the story from your childhood. No pheasants here - he's a beauty! What an elegant looking bird! I wouldn't mind seeing one of those in my yard. Wow, he is gorgeous, what a wonderful surprise to see. I love your story about Freddie and your Mom's pancakes. That is just so funny and what a great memory. Hugs!! 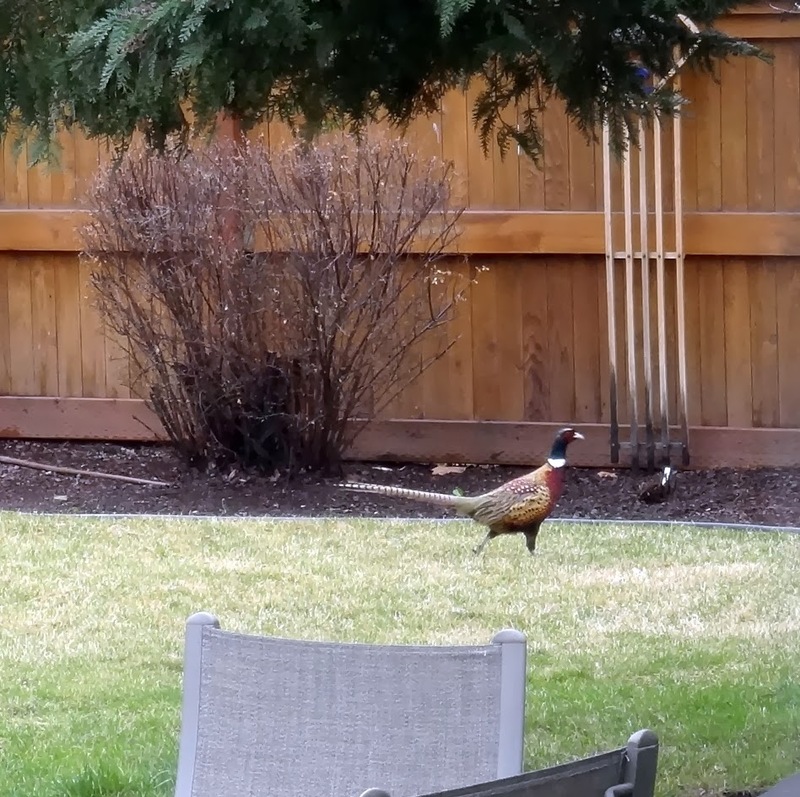 I had to giggle over your story of the pancakes and peacock :-D What a lovely surprise in your backyard to see. Gorgeous bird ! I couldn't stop smiling, reading the story of Freddie, the pancake loving peacock! Beautiful pheasant and how lucky for him, that you planning to make pancakes! That was one smart peacock to return for your Mom's pancakes...no fool either. What an interesting bird to see in your backyard! Very handsome fellow, that Freddie! We live on a bit larger acage than we used to, but no longer have pheasants chuck-chucking out back. I miss our Phreddie Pheasants! What a fine visitor. Hope for your sake, he sticks around for your pancakes! Handsome Freddie! Just wait and see how his colours will be brighter and the red in his face will grow bigger when he gets ready to charm the ladies. He'll be almost as colourful as a peacock. The pancake story is lovely! This is really a great time of year for spotting birds of all types. On Sunday on a drive home from La Conner via country roads or as my dear husband calls it "the scenic route" we spotted 23 eagles perched all within approx. 1 mile vicinity. Yesterday morning driving home from errands again viewed close to a dozen. 7 perched in one tree. Numerous woodpeckers etc. At our backyard feeders and suet. I love spring! Your Freddie is one handsome fella. Oh....he's beautiful. I have them in my little backyard often because my yard backs up to open wetlands. They enjoy eating my dog's food (which he is more than willing to share in the hopes he gets something better. lol). I love them. He looks so majestic! how cool! what a great memory you have of the peacock. What a wonderful memory. I think your new Freddie is very handsome. They are a symbol of Autumn for me as some escape from coops in woodland where they have been raised for the shoots. The colours are beautiful. Freddie will be very happy and safe if he stays with you, no doubt about it. Hey, if you feed him enough of those pancakes, he may become too chunky to fly away! Both he and his hens will just have to hunker down until the pancakes run out. Lovely company for the summer. Is this a plan?